Raspberry Pi Linux distributions and operating systems, The operation of the Raspberry Pi requires an operating system. Usually you will use a Linux distribution. But Linux is not equal to Linux. Just because there's a Linux running on it says nothing about what you can do with it. The operation of Raspberry Pi requires an operating system. Usually you will use a Linux distribution. But Linux is not equal to Linux. Just because there's a Linux running on it says nothing about what you can do with it. However, there are for Raspberry Pi full Linux distributions that leave nothing to be desired. From the desktop, server or media center there is a wide selection. Typically, for the first steps with Raspberry Pi you take the Linux distribution Raspbian. This is not always the preferred distribution. Special tasks always have certain requirements that a Raspbian cannot fulfill. Of course you can expand any distribution and install all conceivable software packages. But sometimes it is better to choose a different distribution, which brings a special software equipment for the requirements. 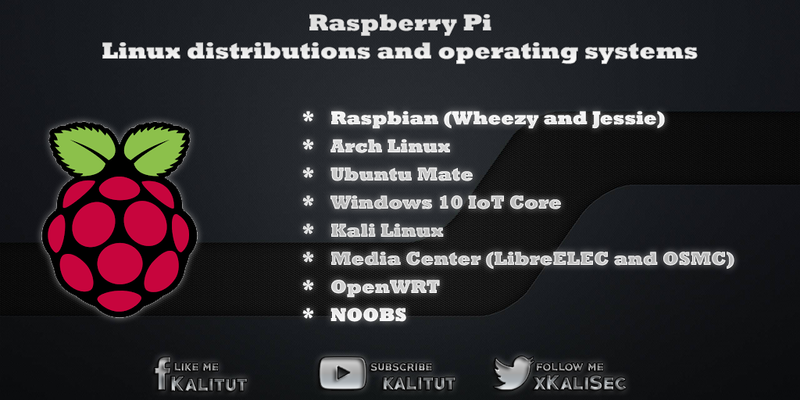 There are many more Linux distributions for Raspberry Pi, but they can not be included here. Basically, other mothers also have pretty daughters. Rasbian is the classic among the Linux distributions for Raspberry Pi. Rasbian is based on Debian, which places great emphasis on stable and secure operation. Unfortunately you do not always get the latest packages for a software update. Nevertheless or just for that reason beginners should always start with Raspbian their first steps with Raspberry Pi. Here are the fewest problems and there is a lot of software already pre-installed included. You also have access to the Debian repository and can install many programs without difficulty. It would be conceivable to use the original Debian. But Raspbian is the better alternative. It is specially optimized for the hardware of Raspberry Pi. In addition, Raspbian's configuration is adapted to the limited resources. If you are looking for a lean distribution right from the start, you should take a look at Arch Linux. Arch Linux brings only the bare minimum. This would make Arch Linux perfect as a server distribution. However, Arch updates new packages immediately, which is ok for a desktop Linux. But on a server, we do not want the latest software, but a stable environment, which is why Arch Linux is then less well suited as a server distribution. Arch Linux shines above all through extensive documentation and therefore worth a look. After the introduction of Raspberry Pi 2, Microsoft has announced that it will give Windows 10 for free for Raspberry Pi. This controversial announcement was misunderstood by many. As part of the developer program, Microsoft offers a special version of Windows 10 for the Maker scene to spread Windows in the Internet of Things (IoT). There are Windows 10 for Raspberry Pi, but not as a desktop version, but only what is offered as part of Microsoft's IoT platform. Media centers for Raspberry Pi are special Linux distributions that enable the storage, playback and management of music and video files. The Raspberry Pi is connected to an HDMI TV, where the multimedia files are played. OpenWRT is an alternative firmware for wireless and DSL routers based on Linux and thus open source. Unless the hardware of a router is not too exotic, there is a likelihood of OpenWRT firmware support. Although Raspberry Pi is not a router, you can turn it into a router. For example with a WLAN or second Ethernet adapter. Most of Raspberry Pi is completely oversized for the purpose of a router. And most distributions too. Setting up a wireless router is usually very cumbersome. If you want to use Raspberry Pi, for example, as a wireless router or similar, then OpenWRT is recommended as a Linux distribution. NOOBS is not an operating system, but a kind of boot manager, which also offers the possibility to install the desired Linux distribution on the SD memory card. So it's an easy way to install and test various Linux distributions on a trial basis. A Raspbian installed does not differ from a manually installed Raspbian. Of course, this also means that for each installed distribution of the appropriate space on the SD memory card must be present. Who has the choice, Which operating system or Linux distribution should I use? That is the question. The answer, it depends. Below is a recommendation.